St Andrew Corsini (1302-1374), an Italian Carmelite bishop is still remembered for his outstanding gifts. He was born in Florence and named bishop of nearby Fiesole in 1349. He responded energetically to the devastation caused by plague (the Black Death) in 1348-49, making care of the poor and needy his first priority, and for this reason was called “the father of the poor”. He insisted on living simply and in Fiesole instead of in his predecessors’ palace in Florence. Wise, efficient, well-organised, and generous, he was an able administrator and a respected moderator in times of social conflict. He set high standards of conduct for himself and his clergy, stressing the importance of education and the need for prayer. His incorrupt body is preserved in the Carmelite church in Florence, where each year in June the city still honours him with a gift of candles and bequests for the poor. His feast is celebrated on 9 January. God of Peace, gift us with faith and patience that we may discover the right path and choose it to be the best way for us. Show us how to use our strengths and insight for the benefit of not only our friends, but all we meet. May Saint Andrew Corsini teach us the meaning of dedication and perseverance. Corsini House has supported the Red Cross Blood Donor Centre in Ringwood for a number of years through financial donations raised by feast days and raffles. After discussions with the manager in Ringwood in 2012 it was mutually agreed upon that our financial support was no longer needed as they had other sources that were sufficient, especially after moving to new premises. We than began looking for an alternative charity that boys in Corsini could support but with more of an emphasis on the concept of ‘Faith in Action’ rather than just raising funds here at the College. After discussions with the Student Leaders in the House we decided to establish a new partnership with Doncare. Since 1969 Doncare has provided support to families, the aged, youth and disadvantaged in the City of Manningham and surrounds. Their approach to working with the community operates on three levels; providing assistance, prevention through support and education, and enlisting community involvement. Their services are primarily delivered by a team of over 500 trained volunteers who are managed by a small team of paid staff. 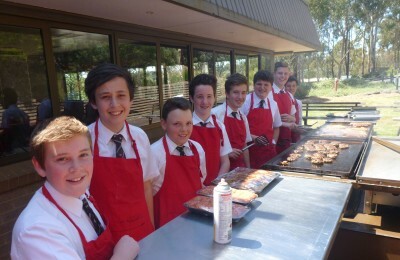 Over the past 2 years boys in Corsini have given financial support for Emergency Relief as well as helping with deliveries to Opportunity Shops and preparing and serving food at Community Forums. During 2013 it was felt we needed to engage our boys and our College with our community to a greater extent so we piloted a Corsini/Doncare charity lunch here at Whitefriars in November 2013. After a successful application to the Lord Mayors Charitable Foundation we were able to build on the success of the first charity lunch and continue with 6 more in 2014. Doncare regularly run lunch clubs with the help of their volunteers, these lunch clubs would normally involve our more isolated elderly citizens of Manningham being picked up and taken to a venue for lunch. We are now providing the venue here at Whitefriars College as Year 8 and 9 boys in each Pastoral Care Group prepare, cook, serve and then eat with our guests. We have also entertained our guests with piano recitals, singing and even a magic show! This partnership with Doncare has involved over a 100 guests and over 50 students throughout this year and is continuing to build upon the theme of ‘Faith in Action’. Click here to learn more about the work of Doncare.